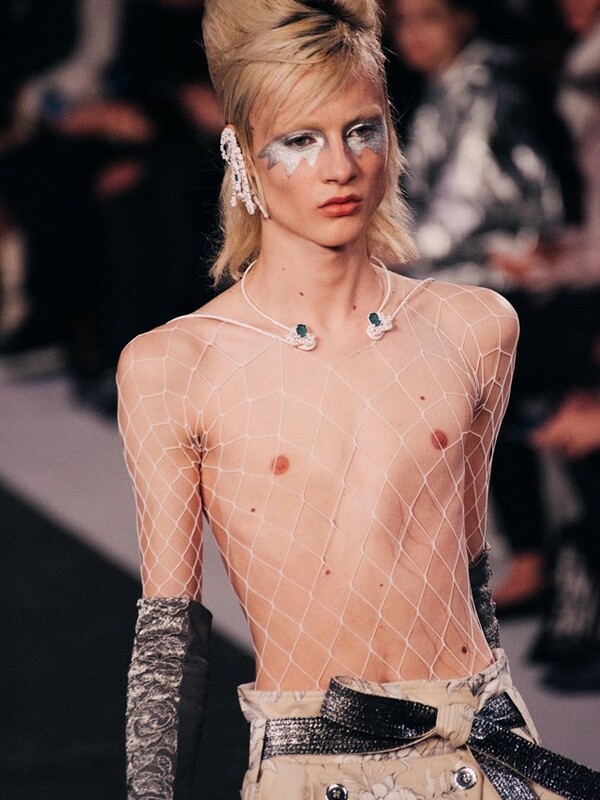 Today, a gang of models took to the Paris runway for John Galliano’s second ready-to-wear collection for Maison Margiela clad in fishnet t-shirts, glam rock silver eye make-up and with limbs wrapped in clingfilm. Despite the event being a womenswear show, that gang included not just girls but guys – although, dressed in the same slinky, skin-exposing jumpsuits and jackets as their female counterparts, their presence went almost undetected. 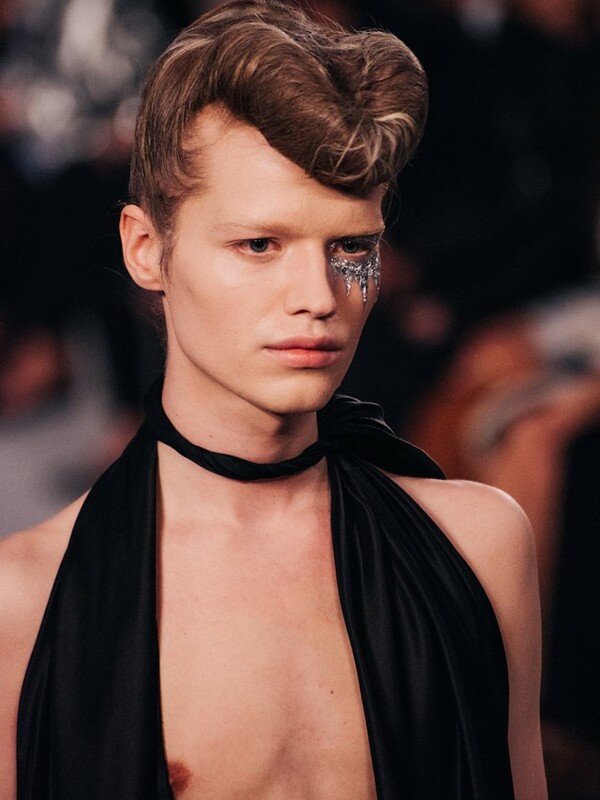 For those who have been paying attention to Galliano’s work at Margiela, such casting decisions shouldn’t come as a surprise – back in July, the designer blurred the boundaries of gender in fashion by enlisting androgynous boys to walk in Margiela’s Artisanal show, something unheard of in the hallowed halls of haute couture. While we’ve been seeing an increasing number of non-binary people take to the runway for underground designers (such as Eckhaus Latta, Vaquera, and Moses Gauntlett Cheng), the same diversity hasn’t quite infiltrated the higher echelons of Paris fashion. This morning’s show proved that change is coming, though. After all, clothes like Galliano’s allow models to embody identities that go beyond a basic boy/girl divide. But who are the designer’s gender-fluid muses? We tracked three of them down. With blonde hair and blue eyes, Vincent embodies a very angelic type of androgyny. And while he loves dressing up as a woman (as evidenced by his Instagram), the Scoop Models signed talent identifies as male. When he’s not storming Paris Fashion Week runways, Vincent straddles jobs working for Time’s Up Vintage, a clothes shop located in Copenhagen, and with fashion designer Mark Kenly Domino Tan. In this show, he modelled a chest-exposing mesh top (with matching tights) and wrap skirt made from a floral fabric, layered over another skirt in silver. Belgian model Maarten was scouted on Facebook by Hakim Model Management. He has studied fashion at the Royal Academy of Fine Arts Antwerp, whose alumni includes Martin Margiela himself, along with the Antwerp Six (Ann Demeulemeester, Dries Van Noten, Dirk Van Saene, Dirk Bikkembergs, Marina Yee and Walter van Beirendonck). Maarten wore a black halter jumpsuit-esque garment with white high heels. For Carl, today wasn’t his Margiela debut; he was cast in last season’s show alongside fellow male models John Whiles and Roan Louch, as well as in the house’s SS16 men’s show. The Stockholm native, who is signed to Premium Models, starred in Loewe’s beautiful SS15 lookbook shot by Dazed 100 photographer Jamie Hawkesworth. Aside from modelling, Carl plays in a band called Tella Viv. At today’s show he wore a similar halter jumpsuit to Maarten, with a green blazer.